During the Annual Visit to Lodge Strathendrick No. 780, Balfron the RWPGM Brother Andrew A McKinnon presented Brother Robert F Bone PM with the Honorary Provincial Grand Rank of Director of Music in recognition of his services to the Craft and to his Mother Lodge over many years. The RWM of Lodge Strathendrick No 780 Brother John Gault also presented a Diamond Jubilee Certificate to Brother James A. Fallas PM. 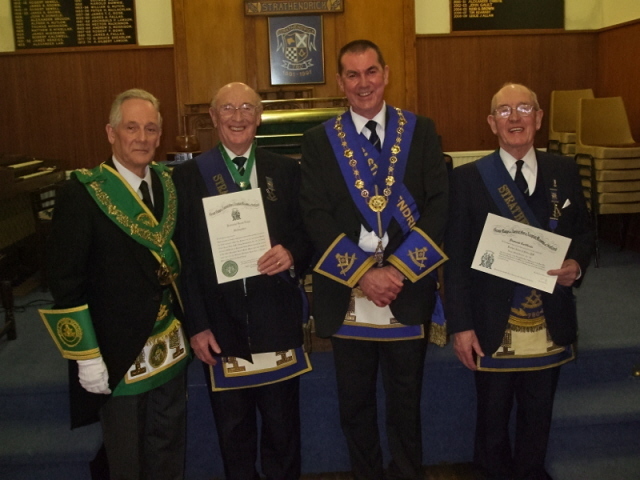 The photograph shows from left to right Brother Andrew A. McKinnon RWPGM, Brother Robert Bone, Brother John Gault, RWM. and Brother James Fallas.